the former two provinces are the most populous in Cuba after the City of Havana. houses were affected with 15,322 totally destroyed and 43,426 losing roofs. due to the heavy rainfall. recovery of Santiago would take years. different parts of the country to join local artists in lifting peoples’ spirits. Good friends of Cuba have also been prompt to supply assistance. with some going to Haiti. However, the need remains great. hit by Sandy, suffered much destruction from flooding, with scores of lives lost. Cuba and other Caribbean countries suffering from natural disasters. receive the financial contributions - also a list of needed goods. donated will go to Cuba. Charitable tax receipts will be provided. that it knows how to multiply the value of any donations it receives. it receives to the best possible use. and please also write "CNC Sandy Relief Fund" on your cheque's memo line. CCFA Toronto   PO Bo 99051-1245 Dupont St  Toronto ON  M6H 2A0. They will forward the info for tax receipts to the Mackenzie-Papineau MF. Please also write "CNC Sandy Relief Fund" on your cheque's memo  line. Charitable tax receipts will be issued in 4-8 weeks. There will be no administration charges takes, not even for postage stamps. On Wednesday May 9th, Lee Lorch, honourary president of the CCFA, was presented with an award from the Canadian Association of University Teachers (CAUT), which has over 66,000 members. The Distinguished Academic Award is CAUT's highest honour and is given annually to an academic in recognition of his or her excellence in all aspects of academic life, scholarship, teaching and service. Usually, the award is presented at the CAUT spring council but unfortunately, Professor Lorch's health will not permit him to travel to Ottawa. The award was presented at the Bridgepoint Health Centre with over thirty of Lee's family, friends and colleagues present. 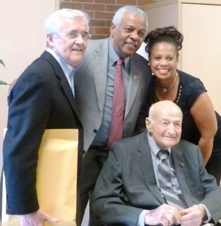 Guests included former Member of Parliament Jean Augustine, former speaker of the Ontario Legislature David Warner, and former speaker of the Ontario Legislature Alvin Curling. In her remarks to the audience, Jean Augustine said Lee is a champion, a fighter, someone who has gone beyond, to support country and ensure things he believed in would be heard. He worked with her in the Canada Cuba Parliamentary group. "Lee lived a life that is full-service, and was always encouraging, nudging, you in quiet fashion to ensure all can move forward in a society where justice is supreme." The award was presented to Lee by Jim Turk, Executive Director of CAUT, who spoke of Lee's work as teacher, researcher and community activist. Lee Lorch was given the microphone noted the struggles for the 8 hour day that is marked all over the world on May first, and the struggles for the rights of women, in which is wife Grace had been active after being fired from her teaching job because she "committed matromony" and the school board did not allow married women work. Lee delighted everyone present to stories of his past work in the civil rights movement in the United States in the 1950's, which resulted in his being fired from four different universities before coming to Canada to work and make his home. Marvin Muldoon, of the Mathematics Deparment at York University, and a coleague of Lee for over 50 years, told of how during a CUPE strike at York University in 2000, Lee insisted they walk in solidarity with the picketers at all seven different entrances to the University. He never gave up. He commented on how well Lee is looking, making a wonderful recovery due to the good care at Bridgepoint. 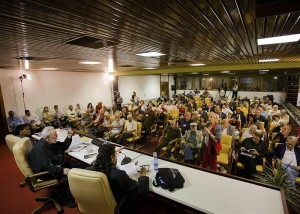 In an all day conference, February 10, 2012, some 120 authors, professors, and journalists, from dozens of Caribbean, American and African countries, met with Fidel Castro. Those attending were invited participants for the “Intellectual Encounters for Peace and the Preservation of the Environment” event at the Havana Convention Center. Topics discussed in the nine-hour session were world peace, environmentalism, neo-liberal capitalism, and the continuing importance of socialism. After the collapse of the USSR, Cuba lost most of it subsidies form the socialist block of nations. The early 1990s were a difficult transition. This was when Cuba opened it doors to those who wanted to leave. Some 30,000 people choose to move to the United States. Yet, ten million people choose to stay and build the independent socialist country that Cuba is today. Several other South American countries, notably Venezuela and Ecuador, have taken note of Cuba’s successes and are moving in a similar direction seeking socialist equality. Peter Phillips is a Professor of Sociology at Sonoma State University and President of Media Freedom Foundation/Project Censored. He co-edited with Mickey Huff Censored 2011, which was published in Spanish for the International Book Fair in Cuba. 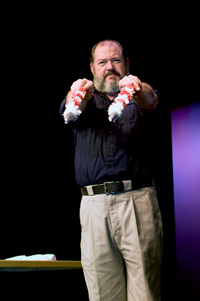 Mickey Huff is the director of Project Censored and editor of the recently published Censored 2012, which was presented to Fidel Castro February 10, 2012. Washington DC was the site of a truly historic event. Hundreds of people rallied for the freedom of the Cuban 5 and I had the great pleasure of being there. On April 20, I attended a luncheon hosted by the ever-gracious Chief of the Cuban Special Interests Section, Jorge Bolanos. I was particularly impressed by a conversation with Wayne S. Smith. Wayne was Chief of the American Special Interest Section in Havana under the Jimmy Carter administration; however, he found his government’s policy so misguided that he resigned rather than implement such harmful actions. His current attitude is no less clear. He said that the position of the American government today is positively “medieval” and that he was befuddled as to how bad American governments over half a century could maintain the same bad policies, doing the same thing over and over again and always getting the same result, the same negative result. By the way, Wayne, as a young staff member at the old American Embassy in Havana, actually met Ernest Hemingway. That evening a large crowd gathered to hear several people speak of American injustice towards Cuba. Salim Lamrani, a French journalist and researcher, pointed out some of the more outrageous aspects of the American blockade. For instance, if a Mercedes automobile from Europe contained even five cents worth of Cuban nickel mixed in an alloy, that car could not be imported into the United States. If a French freighter brought a shipment of rice to Cuba, it could not enter an American port for six months after the delivery. Salim’s point was that America was illegally imposing its irrational behaviour on the rest of the world, a behaviour that has been condemned by the United Nations and by every human rights organization in the world. Much applause was reserved for Dolores Huerta, co-founder of the United Farm Workers and still inspiringly active at the robust age of eighty. More applause greeted actor and activist, Danny Glover who spoke of justice and how it is spoken of, hypocritically, by America but not applied. On Saturday, April 21, I awoke early, rehearsed my lines for Hemingway’s HOT Havana and then headed for the White House. When I arrived, I saw a modest number of people preparing to rally in support of the Cuban Five. At first, I thought, “Where is everyone?” Surely there are more people than this. I didn’t have to wait or wonder very long. My eyesight may be bad but my hearing is very good. In the distance, I heard what sounded like chanting. Within moments, I saw them, hundreds of them, flags flying, banners blowing, voices vibrant in their protest. “Obama, give us five!” They marched strong and proud and tall into the brightness of the sun and the heart of America. It was a moment of fierce pride as I felt the thrill of excitement run through my entire body. Words cannot express how glad and how proud I was to be there at that precise moment. The closing event took place at the Bolivarian Salon of the Bolivarian Republic of Venezuela. First came a truly tender performance by the DC Children’s Theatre Group who, in a way that can only be achieved by the honesty of young children, presented a dramatised tribute to Cuban doctors. Next came a speech by activist Cindy Sheehan, who reminded everyone that she is a true fighter for justice and has been willing to go to jail for her beliefs. Finally, I presented my play. The reaction was wonderful and I was humbled by both the standing ovation and the number of people who said they were moved by such an expression of love for Cuba. My compliments to Alicia Jrapko and all the fine people who helped to prepare and organize this moment in history. Major compliments to Ambassador Bolanos and all his excellent staff at the Cuban Special Interest Section for their hard work, for their many individual efforts and for the warmth, the gracious humour and the support which they imparted to even the most difficult moments. On a personal note, special thanks to the staff volunteers who participated in Hemingway’s HOT Havana and the famous “rum carburetion” scene. Their applause was well deserved. All for THE LOVE OF CUBA. On December 3-4, 2011, a historic meeting of all 33 Latin American and Caribbean countries took place in Caracas, Venezuela. It was a gathering that significantly advanced the Latin American Revolution. The Presidents of these nations assembled to inaugurate a new regional organization called The Community of Latin American and Caribbean States (CELAC), which includes all these countries but excludes the United States and Canada, who were not invited to join. 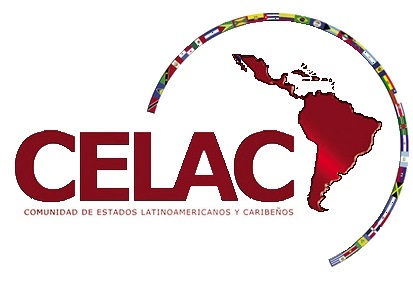 CELAC looks set to become one of the world’s most powerful regional blocs. It is aimed at deepening the integration of Latin American and Caribbean states, freeing them all from the threat of U.S. imperialism and promoting social development. HAVANA, Cuba, Mar 15 (acn) Lisa Makarchuk, outstanding and loyal Canadian solidarity-with-Cuba activist, received the Friendship Medal in this capital on Thursday, following an agreement by the Council of State, as an acknowledgement to her important work aimed at promoting the island’s image in her country. The ceremony took place at the Cuban Institute for Friendship with the Peoples (ICAP), in the presence of Kenia Serrano, president of that institution, and of Matthew Levin, Canadian ambassador to Havana. The award also acknowledges her excellent work to spread and defend the achievements of the Cuban Revolution, and her perseverance in the struggle to put and end the US blockade of the island and in favor of the release of the five Cuban heroes unfairly condemned in that northern territory. Makarchuk arrived to the Caribbean island in 1961, in the days of the Literacy Campaign; attended the proclamation of the Second Declaration of Havana; worked at national radio stations; and was president of the Cuba-Toronto Friendship Association. From 1998 to 2000 she was Honorary Consul of her country in Varadero, and in 2009 she organized the First International Festival on Poetry of Resistance, in honour of The Five. She also contributed to the spreading in Canada of the work of Cuban Apostle Jose Marti. Makarchuk assessed the occasion as “a very comforting moment,” and recalled the long history of bilateral relations and of lasting bonds of cooperation, in objectives like equal opportunities, education, culture and health.